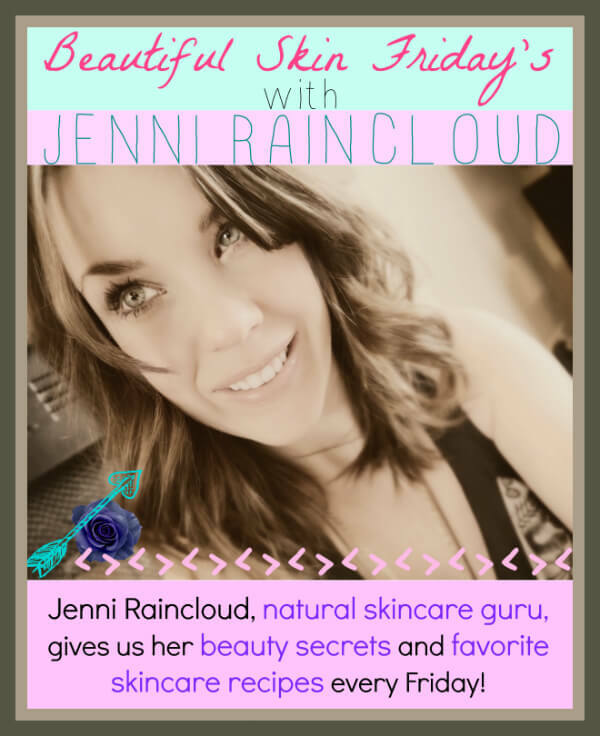 It’s another edition of Beautiful Skin Friday’s with my favorite all natural beauty and skincare guru, Jenni Raincloud and today she teaches us how to make hand soap. 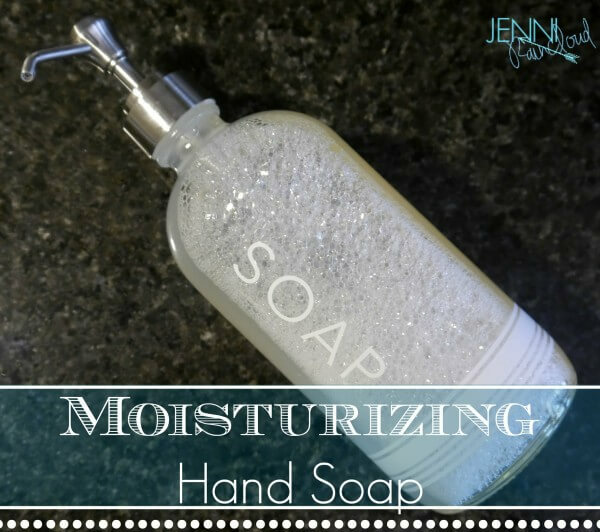 I have been looking for a good hand soap recipe and this one is just what I was looking for – It’s perfect! 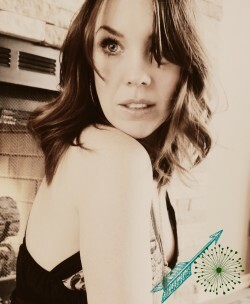 Jenni to the rescue again! 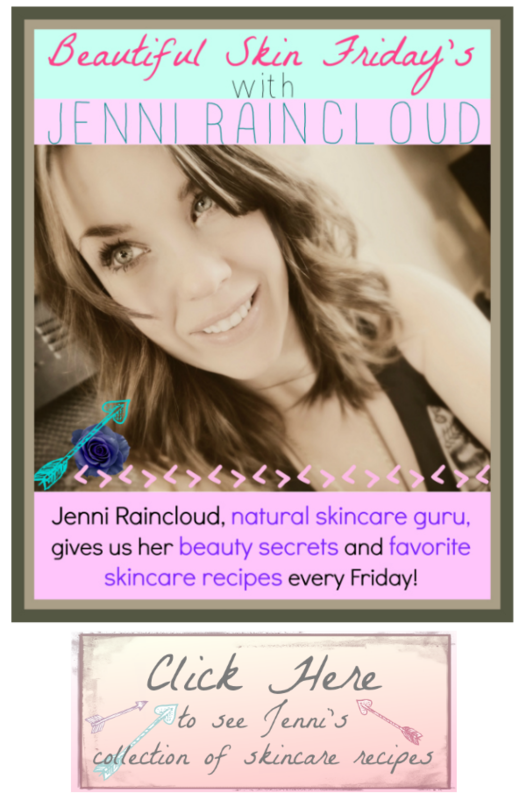 Jenni’s skincare recipes have totally transformed my skin – check out her blog for the best beauty and skincare recipes out there! Hello! Jenni from Jenni Raincloud here, for your Beautiful Skin Friday! Before my DIY days, I loved to head to my local Bath & Body Works and load up on hand soap. They seemed to always be running a “buy 4, get the 5th free” kind of special. You can smell Bath & Body Works 3 stores down so it was never hard to overlook. While it smells lovely-I no longer get my hand soap there for two reasons. One, making your own hand soap is easy. Two, like most things-anti bacterial hand soap is full of harmful chemicals. Today, I’m going to teach you how to make a hand soap that is every bit as fun and effective as a Bath & Body Works soap, plus it’s easy and toxin free!! So, before we get started, let me give you some incentive to make your own hand soap. Antibacterial soap is full of harmful chemicals. Namely, triclosan. Triclosan’s list of side effects are a mile long. Several that stand out are that it is a hormone disruptor and causes damage to liver function. 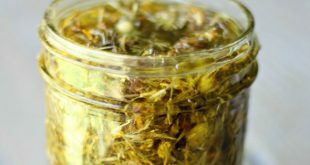 It is linked to allergies, eczema and asthma. Studies have shown that antibacterial hand soaps are ineffective to viruses like the flu and colds. Also, it’s been proven that antibacterial hand soaps leave behind strong bacterias such as MRSA. There is also a theory that we are setting ourselves up for a Mega Virus that is evolving and becoming immune to antibacterial hand soap. Another issue with hand soaps is the artificial fragrance. As I stated above, commercial soaps are FULL of fragrance. 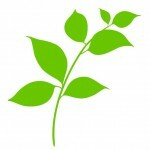 Synthetic fragrance is known to disrupt hormones. Essential oils are a much healthier alternative to both these harmful chemicals so let’s get started! Squeaky Clean Homemade Hand Soap! This recipe makes about 8 ounces. This recipe is a bit watery even with the thicker aloe. Guar gum will thicken up liquid recipes when blended. 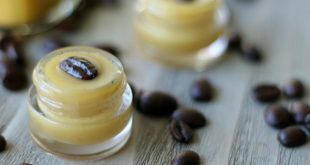 It will change the consistency of the soap from a gel to a cream. 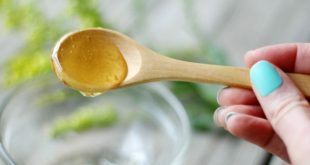 Feel free to add a teaspoon to this recipe if you prefer a thicker soap. Lemon Essential Oil does a great job at cleansing and de-greasing! It pairs well with bergamot, lavender, melaleuca (tea tree), and even warmer scents like sandalwood. Shield Essential Oil (also known as Thieves, or OnGuard)-This oil is proven to fight against viruses and bacteria. It’s an absolute must during winter months. Homemade shield hand soap is in every bathroom during the flu season. Lavender Essential Oil– Antiviral, antibacterial, anti fungal. Also provides extra moisturizing benefits as well as calming properties. Lavender pairs well with almost every oil-get creative with this one! Nature-Outdoor Essential Oil Blend– This blend contains the most cleansing essential oils-This is a blend of lemon, eucalyptus, citronella, lemongrass and other pharma-grade essential oils. It smells amazing and is the perfect scent for a hand soap!! Melalueca (tea tree) and Lemongrass-I love these smells together and Tea Tree is one heck of a powerhouse essential oil when fighting bacteria, plus it smells so clean and fresh! Add Water, Glycerin, Essential Oils, NeoDefend, Citric Acid and Aloe to a blender-blend on high for 40 seconds. Pour castile soap in a pump bottle (like THIS) . Add blender mixture to bottle. 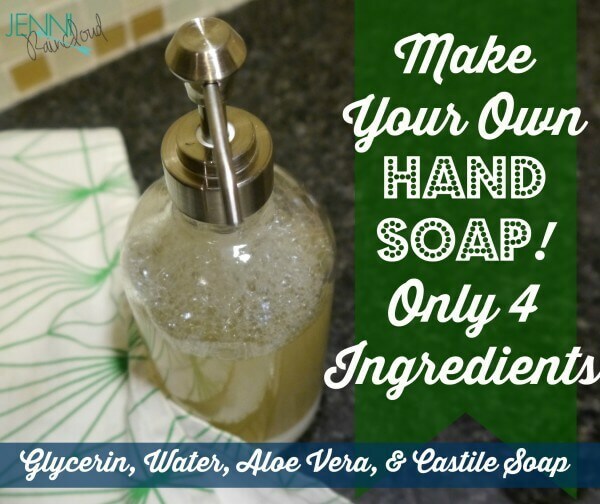 There you have it-A fast and simple way to ditch the chemicals by making your own customized hand soap! See you next week and for more on DIY hand soaps, check out my post on DIY foaming hand soap! 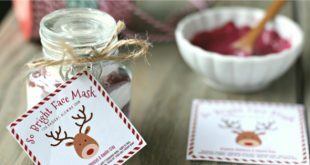 Update: Since writing this recipe, I have learned more about preserving DIY products containing water. Unfortunately, anytime water is added to a recipe, it becomes susceptible to mold and bacteria. I have added NeoDefend to this recipe to help preserve the shelf life. NeoDefend is a gentle, certified organic preservative that does not contain propylene glycol or formaldehyde. You can read more about it HERE. If you would like to skip using a preservative, you should cut this recipe in 1/2 and keep it in the fridge. To be safe, I would throw it out after 2 weeks. Also when working with soaps, like castile soap, you must be careful with pH. Soaps have a very high pH. This is what gives them their cleansing power. Typically soap has a pH of around 13. This is extremely high for our skin and can cause dryness as well as irritation. A pH balanced cleanser should have a pH of around 9. By adding citric acid, you can lower your pH to a more balanced level for your skin. Citric acid is absolutely necessary in all cleanser recipes and should never be omitted. I have edited this recipe to reflect this new info. I’m sorry for the confusion!! I am allergic to Aloe Vera. Is it necessary to the recipe’s success? Any suggestions for substitutions? I also react to tea tree. Can I leave out the NeoDefend? Will the recipe work fine without it? I quit going to Bath & Body Works when they quit selling their Lotion Hand Soaps. This would be perfect for me!! My only question would be, is it safe to use the pitcher on the blender for these products AND food, or would I need to get a separate pitcher? Hey Becky! 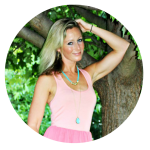 I’ve been making mine in the same pitcher and blender as I use for my food products – no problems! The link to the aloe vera gel suggested does not work. What aloe vera gel do you use?